Dear Shane Mosley, you should have spared the pleasantries and gave us a fight. [firstpara] While watching the fight between Manny Pacquiao and Shane Mosley, we had flashbacks of the painful experience of watching the glorified sparring session between Pacquiao and Joshua Clottey. If the crowd starts booing on a Pacquiao fight, there are only two reasons: when his opponent employs dirty tactics against Pacquiao and when the opponent ain't fighting back. The crowd booed many times in the Pacquiao-Mosley fight Sunday. With good reason. They paid good money to be there. Many of those present flew in from elsewhere in the world just to see that fight. The only thing they wanted in return is to see an exciting battle. Pacquiao tried to give it to them but Mosley chose to stay away from danger than fight for a chance to win the match. After the third round knockdown, Mosley was never the same. The crowd urged him to fight, Pacquiao urged him to fight, and his own trainer practically begged him to fight; all to no avail. Mosley knew that if he kept his guard down even just for a moment, Pacquiao can catch him with a punch similar to the left which knocked him down. The result was a boring unanimous decision victory for Pacquiao. “I want to give the people a good fight,” Pacquiao always says. A fight can be considered good for most fighters as long as they have their hand raised in victory. For Pacquiao, a good fight is not just about winning. 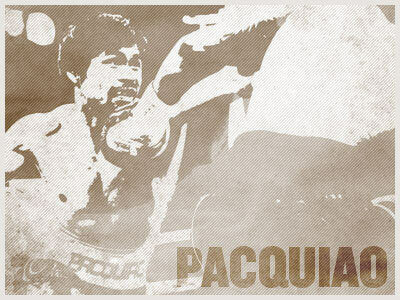 Pacquiao craves for the slam-banging, arena-rocking, crowd-pleasing fights that leave people speechless. Sunday's fight is nothing of that sort. Mosley was very disappointing. Yes, little was expected of him, but we thought he'd at least bite back. Mosley was never the kind to shy away form a good fight but that was exactly what he did against Pacquiao. In the episodes of Fight Camp 360, Mosley was telling anyone who’d listen that Pacquiao's style is tailor-made for him. Pacquiao comes in carelessly and Mosley, being the harder puncher, thought that he'd cause Pacquiao some trouble. Pacquiao had more trouble on his way to the arena that in the fight itself. Mosley harped about proving the world wrong—about performing his best when nobody expects him to win. In the fight against Pacquiao, he proved all his doubters right. He is indeed too old for the sport of boxing and he needs to retire now. What’s more painful is that Pacquiao prepared really hard for this fight. He concentrated on his training and brushed aside distractions. Mosley disrespected Pacquiao by not fighting back. He also disrespected the fans, and even his trainer, Naazim Richardson. Mosley is one of the best fighters in the world and he did his best to prepare Mosley for Pacquiao. He broke down Pacquiao’s game and devised a plan to exploit his mistakes. It must have been difficult for Richardson to be in the corner of a fighter who does not want to win the fight. Pacquiao was capable of doing so much more in that fight but Mosley did not allow him to do it by riding his bicycle around the ring. However, Mosley's performance got us thinking. Are Pacquiao's opponents really wussing out or is it a natural reaction when faced with the tireless fighting machine that is Manny Pacquiao. Miguel Cotto rode on his bike in the latter stages of the fight against Pacquiao. Clottey did not take his hands away from his face all night long. Now even Mosley ran from Pacquiao. The only fighter who kept on coming back was Antonio Margarito and we all know what that got him. Pacquiao breaks his opponents' faces as well as their spirits. He makes you feel slow when he connects four and five punch combos to your face before you can event react. He makes you look like a fool when you miss wildly while trying to throw a counter. He makes you look weak when he lets you beat him up him only to walk through your best punches. During the middle of the fight, Pacquiao's opponents only have two choices: To fight back at the risk of being beaten up further or to stay away because you do not have a shot at winning anyway. Three of Pacquiao's last four opponents decided to stay away. Margarito, the only one who was gallant enough to keep coming also ended up getting the worst beating. In the end, the hate, the disappointment we feel over Mosley, Clottey, and Cotto may be largely undue. They all did what they did because they knew it was best for them. We want them to entertain us with action-packed fights but in the end, it is their bodies taking a beating, not ours. Choosing not to fight back for the risk of being beaten up is the most glaring evidence of surrender. The fact that Pacquiao made erstwhile warriors cower in fear of being pummeled only support Bob Arum's claim that Manny Pacquiao is indeed on of the very best fighters to ever lace a pair of gloves. We are all lucky to be living in the era of Manny Pacquiao. Savor it while it lasts.